Cedar 10 Hole Low Copper Roof Birdhouse Amish Made in USA. 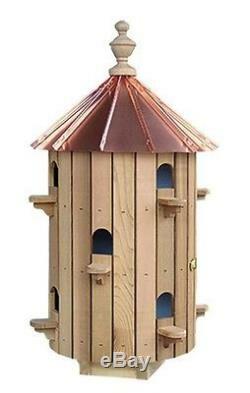 Birdhouse with Low Copper Roof is a masterpiece of craftsmanship. Made in Lancaster County, Pennsylvania by an Amish craftsman. The access openings are 1.5"W x 1.75" with a landing porch outside. Each of the ten pie-shaped compartments measures 8" x 6". Outside dimensions = 26" high x 14" diameter. 4" x 4" mounting bracket included. Cleanout: Unscrew the finial (it's connected to a long threaded rod that screws into the base), remove the mounting bracket, unlatch and open. This Item has no end time. The item "Cedar 10-Hole Bird House with Low Copper Roof Amish Made in USA" is in sale since Wednesday, April 12, 2017. This item is in the category "Home & Garden\Yard, Garden & Outdoor Living\Bird & Wildlife Accessories\Birdhouses". The seller is "amishshop" and is located in Lyndell, Pennsylvania. This item can be shipped to United States.